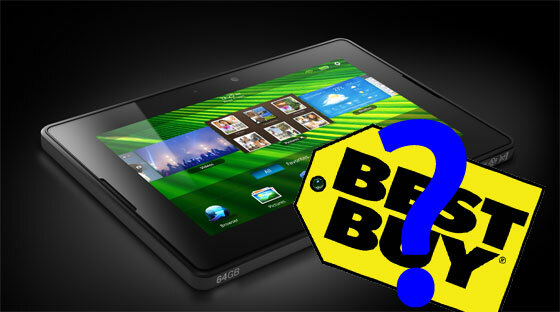 Best Buy USA pulls BlackBerry PlayBook from its online offerings? News from the blog electronista reports that Best Buy has pulled the BlackBerry PlayBook from its online store and that several customers have had their orders cancelled. Some shoppers who placed their order with the retailer complain in the store's online forums of orders cancelled without notice - some sources say all orders were cancelled. A quick check of the Best Buy (USA) website confirms that the tablet is no longer listed. Indeed, a strange move to make before the so-called Cyber Monday. Before the cries of doom and gloom for the BlackBerry tablet sound, there are a few things to take into consideration. Although the BlackBerry PlayBook is missing from the Best Buy USA site, the tablet is still selling - and at a discount - on the retailer's Canadian site. Additionally, those same customer forums also seem to point to the retailer having overextended itself and actually selling more BlackBerry tablets than they physically have available to them. Anecdotally, friends and family have reported to me that they've been having a hard time finding the BlackBerry PlayBook in Best Buy stores, with the 32 GB model being in extremely short supply. What does all this mean? We're not exactly sure yet. In this writer's opinion, it seems that the BlackBerry PlayBook is selling better than the retail giant expected. With so many retailers - and ShopBlackBerry - offering the PlayBook at a ridiculously good prices, the supply chain has to be stretched pretty thin. Rather than face embarrassment of placing its customers on indefinite backorder, it's possible that Best Buy has simply removed the item from its online inventory. Of course, this is naught but speculation by this blogger, and the tablet could return tomorrow. But if it does, Best Buy has some ‘splaining to do to its customers with cancelled orders. Then again, Best Buy doesn't exactly have the best track record when it comes to selling tablets at a discount.